When I think of spring I think of flowers blooming, birds chirping and kites flying. All three of these make me quite giddy, but let’s face it, going to a park on a windy day and flying a kite, well life doesn’t get much better than that. I still have fond memories of flying kites as a family and then on dates, but I think my best kite memories are the years I spent teaching school and each year as an art project I would have my students create their own beautiful kites and then on the first windy day we would go out and fly them. So this year I decided to once again make a kite . 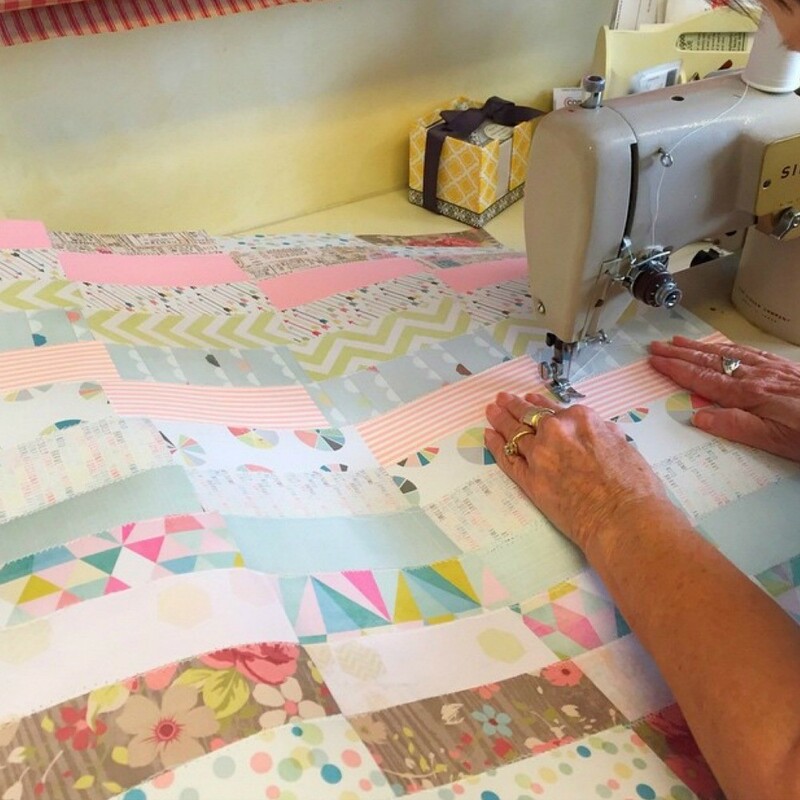 . .
By quilting the paper together and then folding and hot glueing it to the sticks. And is this lacy tail the cutest thing ever? It’s going to be my front door greeter. As well as my spark for a spring tea party. 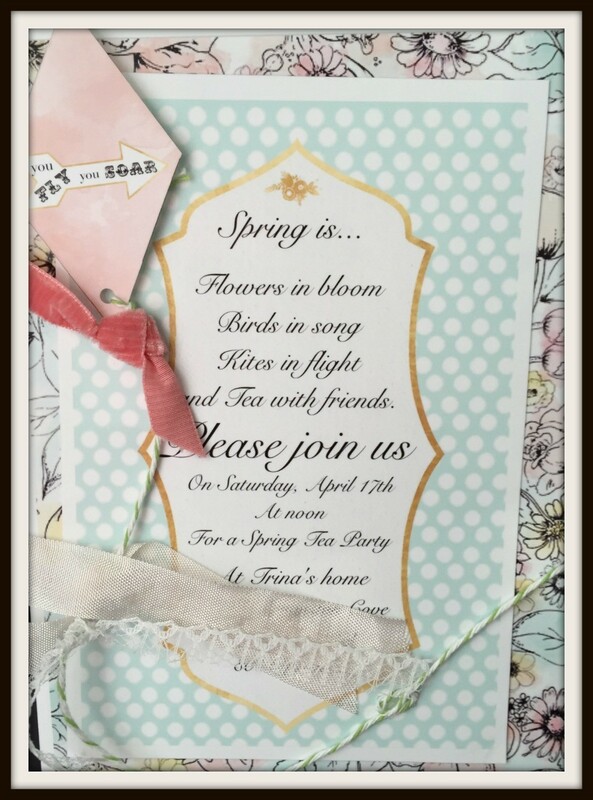 I used my three loves of spring to create the invite . . .
Got busy making more kites . . .
lots and lots of fun kites, that hung on my wall as a banner . . .
even hanging from the chandelier and ceiling . . .
And welcoming my guests as they arrive. Then you know me, I started on my table scape . . .
Incorpating a kite as well as some birds and flowers. 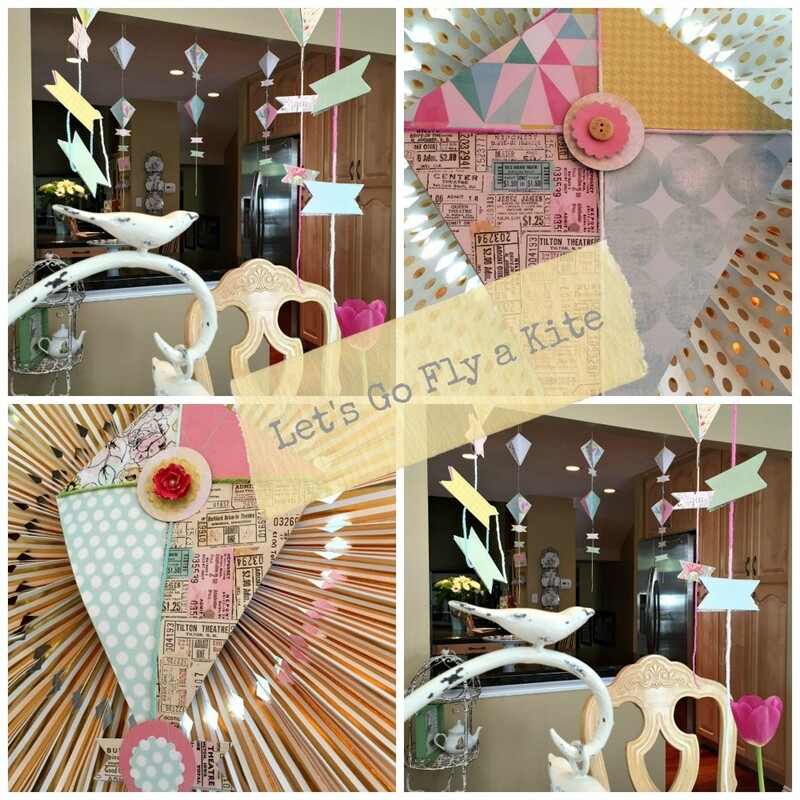 And adding a few pictures that went along with my kite theme. 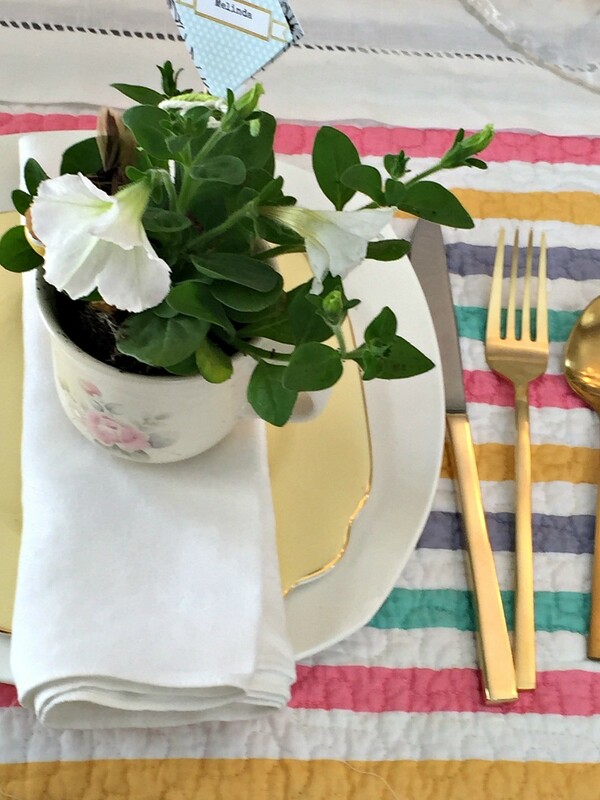 For the place setting this time I used my white china dinner plates, pastel china salad plates, and gold flatware. 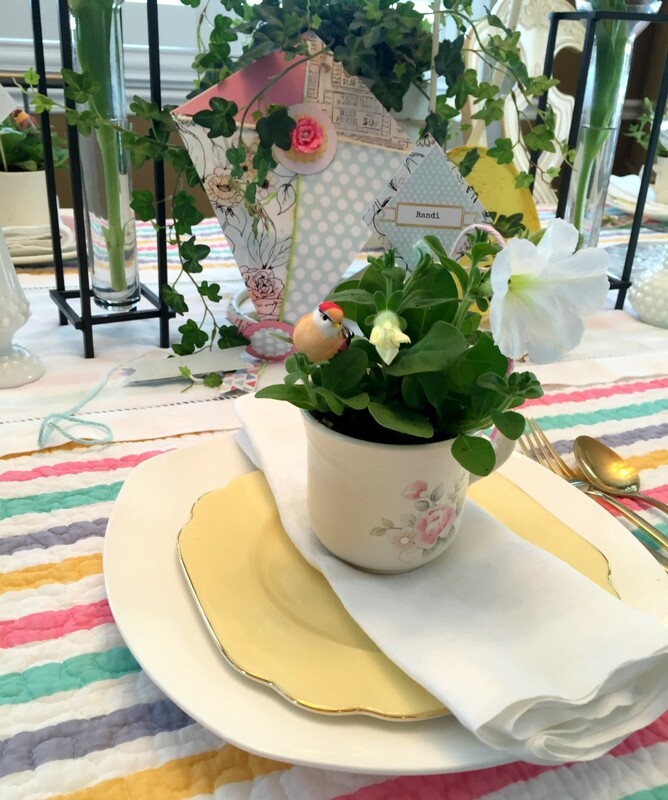 Placing a neatly folded white linen napkin underneath this fun tea cup which was used as both their party favor as well as place cards. 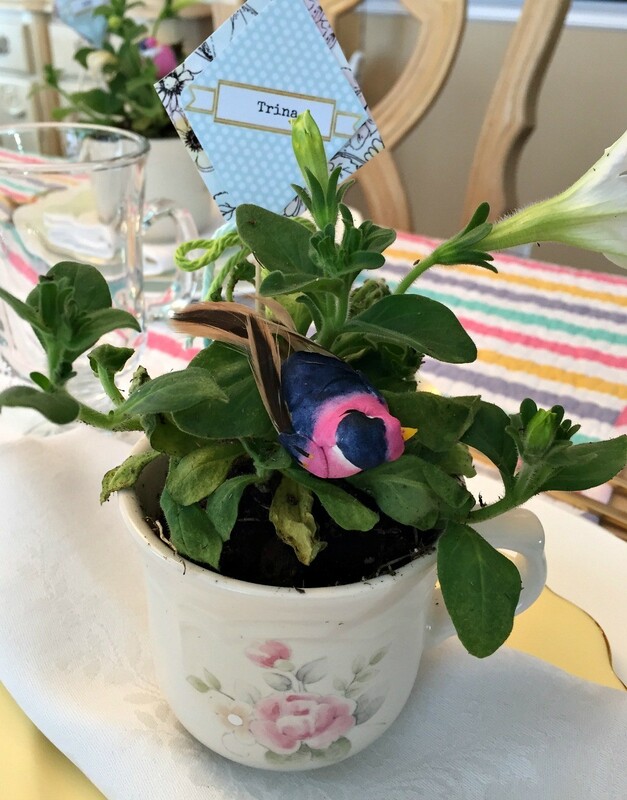 I wanted their party favor to also go along with the theme of birds in song, flowers in bloom and kites in fight. Once again pulling out and using my ralph lauren bed spread using the stripe side this time, it was the perfect choice to liven the table up and it just reminded me of kites. 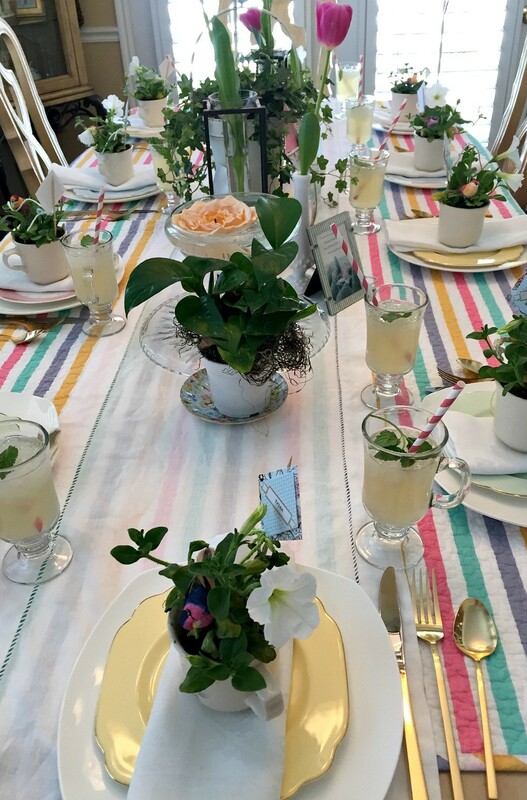 Table was all ready with their fresh drinks and place cards as they entered my home. What an enjoyable afternoon we had, sharing lots of fond memories, making new friendships and filling my home and heart with all kinds of laughter and joy. As promised for my guests here’s the recipes from our menu. Blend until it’s like a smoothie. Mix with no water, just lots of ice. In a bowl combine sugar and chili powder; sprinkle evenly over pineapple. In a nonstick skillet, cook pineapple 10 minutes over medium heat, turning once until sugar is caramelized and pineapple is golden brown. Remove pineapple and cool at least 10 minutes. Cut into the 1 inch pieces. In a large bowl whisk together oil, vinegar, orange juice, cilantro, garlic, 1 tsp. salt, and a pinch of pepper (I also like to add maybe 1 tsp or more sugar). Add pineapple, onion, sweet pepper, avocados, and blackberries; toss gently to combine. Add lettuce, toss gently until mixture is just coated and serve. Stir together 1 (8ounce) package cream cheese, softened; 1/2 peeled, seeded and finely chopped cucumber, 1/3 cup mayonnaise, 1/4 cup minced red onion, 3 Tbl. finely chopped fresh basil (I prefer to use 1 table spoon basil and 2 table spoons of fresh mint), 1/2 pepper, 1/2 salt. Spread on white bread with diced strawberries. Stir together 1 (8 ounce) package cream cheese, softened, 2/3 cup dried cranberries, 1/3 cup orange marmalade, and 1/2 cup chopped toasted pecans. Spread on pumpernickel bread with thinly sliced smoke turkey and fresh arugula. 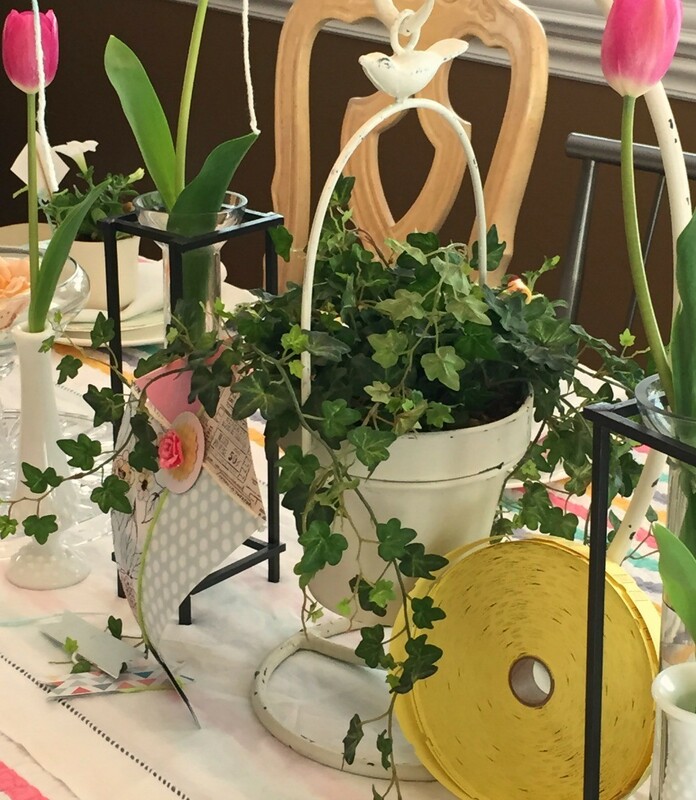 Linking up today with Jennifer @awellstyledlife and Heather @stylemindchic for their new link up party about inspiration. What inspires you and others to live the way your do, dress the way you do, decorate the way you do, etc. 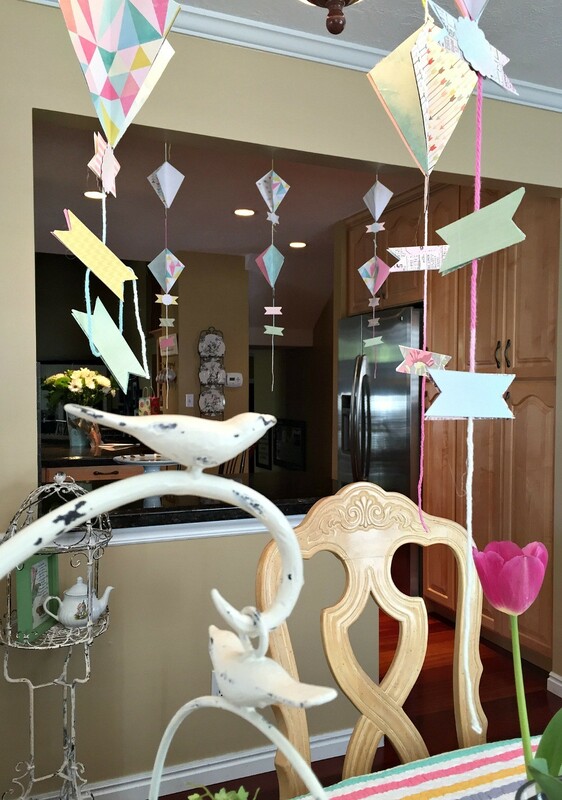 Today I’m sharing how this simple kite inspired my Spring time tea party. It only takes one item to light a creative spark. Jennifer, I would love for you to join my for a tea party. I do have a few guests rooms so I’m dead serious about this. So glad you will be trying the salad and swiping the party favor ideas. By the way, I always hun the local thrift stores for fun sets of tea cups and vases for things like this. The kites are so cute and the tea party sounds wonderful. Thanks Jolyn, it really did turn out to be so much fun. This seems just divine! And the menu is brilliant! Assuming you’ll invite me! LOL of course! Like I told Jennifer, I do have a few guests rooms so I would love to have you. I am crashing even if I am not invited 🙂 I will bring a bottle of wine to share! One of these days, I would love for you to attend. Seriously!!! 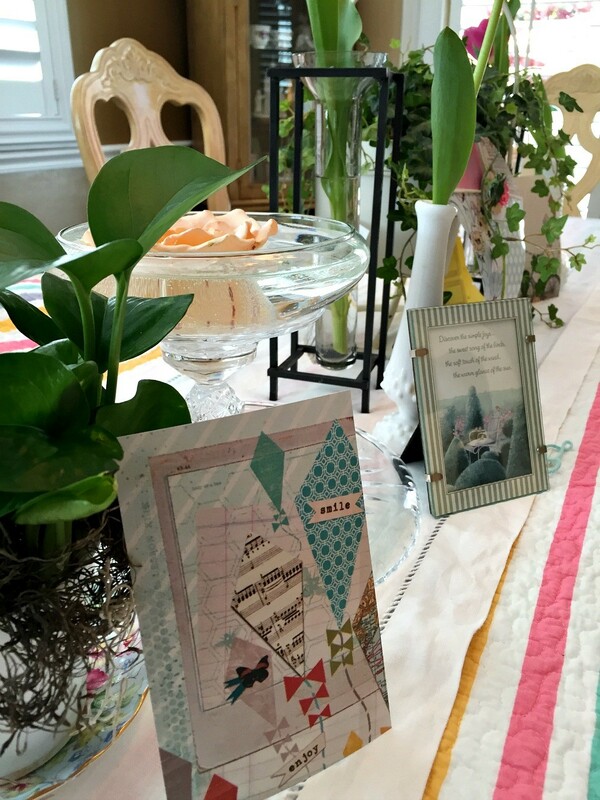 Trina – always a wonderful setting, such a great spring party! We love flying kites but haven’t made one ourselves. Isn’t kite flying the best family outing? What a grin I am wearing now! 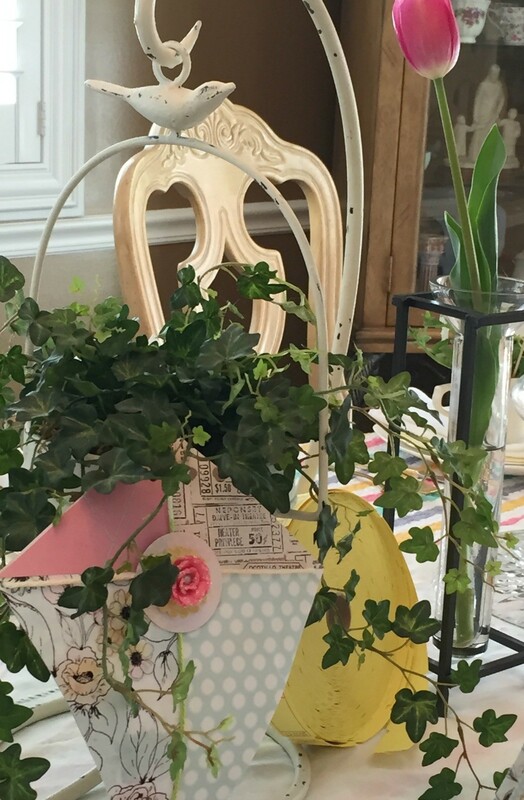 Loved this post, all of the photos of your home decorated for a spring tea party is so bright and cheerful. 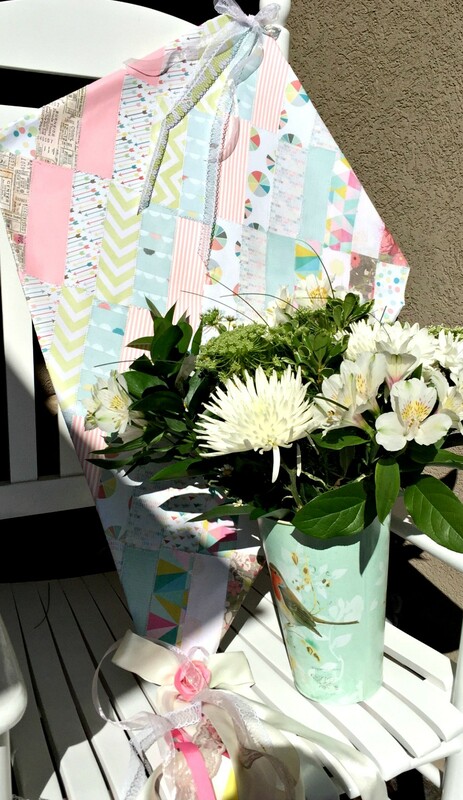 Love the striped tablecloth, and I am so glad you are featuring that gorgeous kite that you and your mom made. What a creation! Also love the chambray dress, and your necklace is similar to mine from my last post with the velvet ties! It really is a shame you live so far away, becuase you, too, would be invited. oh so nice to have you visit my blog/site. I can tell you are a decorative person where I am much more minimalistic, for sure. But I will take your suggestion to heart. Sometimes I get a wild hair and go for a bit more flounce. lol. 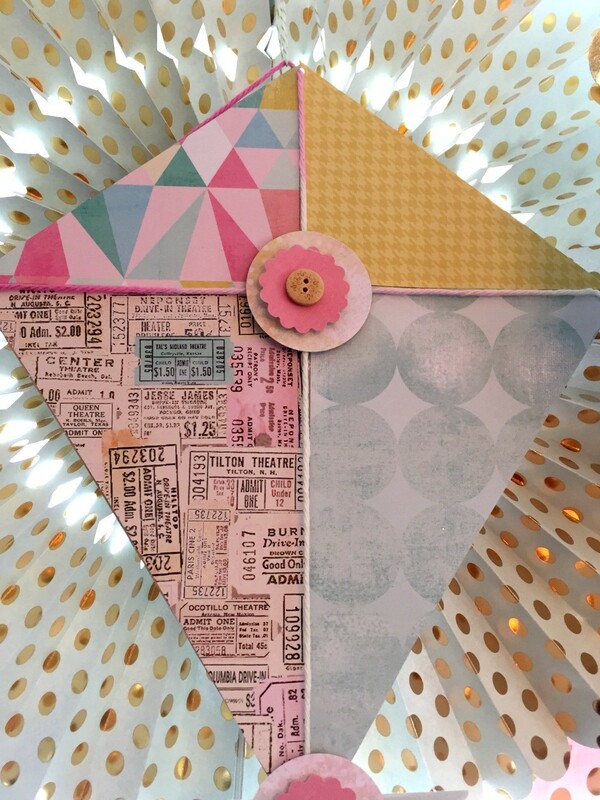 Your quilt print kite is very cleaver. Many great ideas in your post and looking forward to hearing from you more. Delightful! What fun, inspiration and creativity. Thank you for visiting me, I will be visiting you again very soon! OMG, you’re the best hostess ever, Trina! Can you believe that I’ve never flown a kite? I need to add that to my to do list! I’m in! sign me up!! You are so creative, Tina! 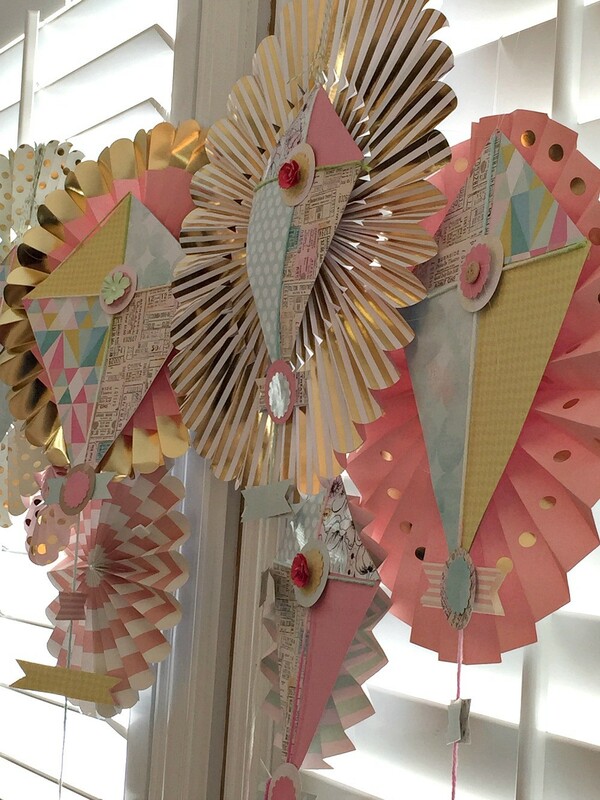 The kites are absolutely swoon worthy. 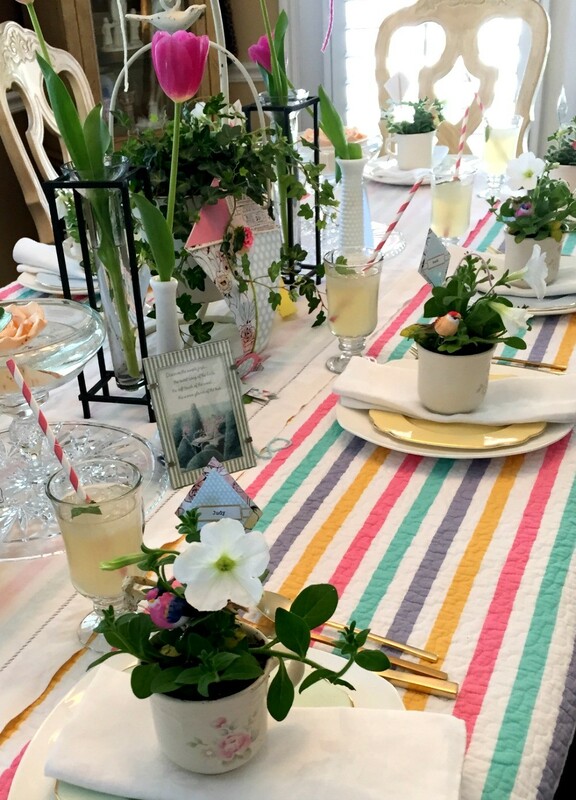 Your soiree looks so festive! I think you have thought of every detail to make your guests feel right at home. Love that photo of you holding the prettiest kite in the world. Your menu sounds amazing. I will be pinning this one! Thank you so much for joining our Lifestyle LinkUp and I hope you come by next month to share your lovely links as well. Happy Weekend! 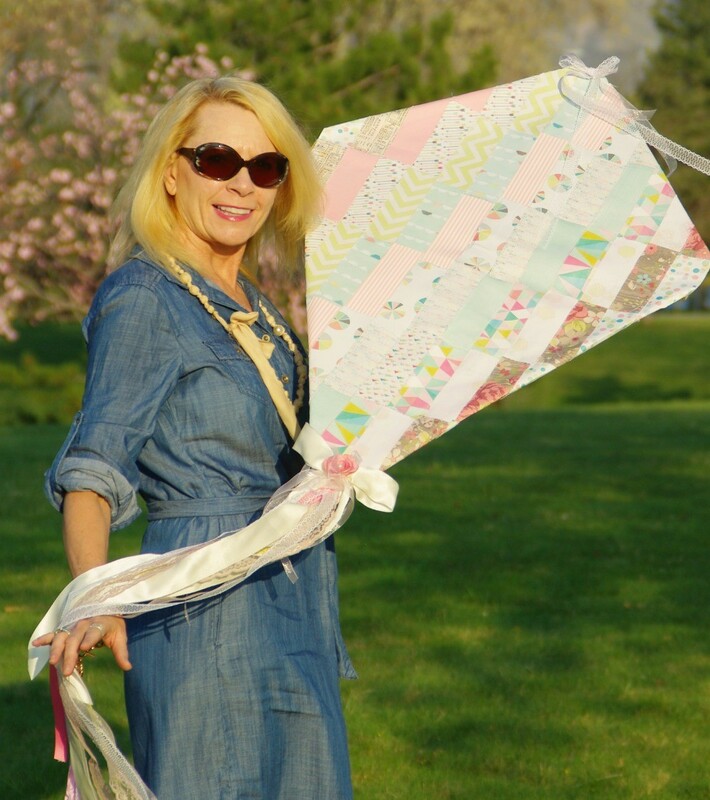 YOUR kites are MAGICAL……..and I adore that ANTHRO denim dress on YOU! Those DAMES sent me JENNIFER & HEATHER.I am having a BALL visiting this morning each and every POST added!I do Believe YOU are good friends with Madame BEARDSLEY??! !You all live in a Beautiful spot……………I lived there many moons ago and am lucky to visit now and again especially when Roger’s Gardens is in Full Swing!My cousin owns it and I adore visiting it!HOpe you will POP over and say BOO to me! 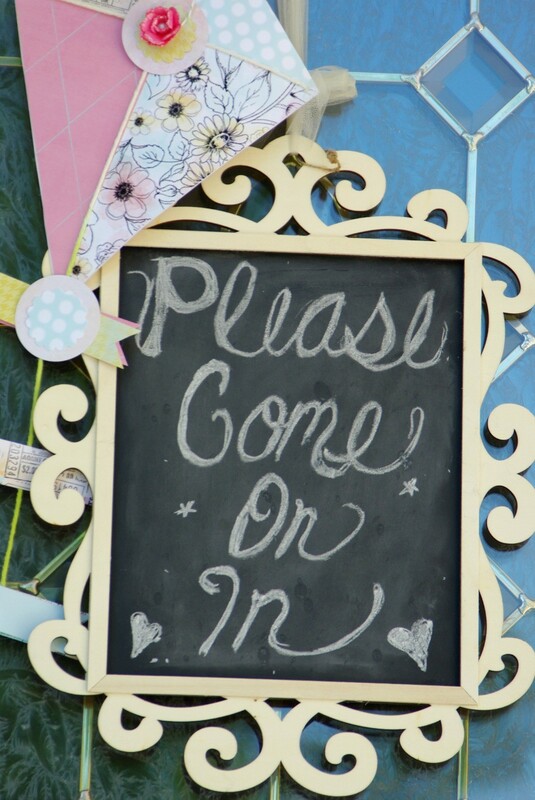 Hi Trina, Thanks for visiting my blog:) What a lovely party you are hosting! The kite is so fun and you Avocado Pineapple Salad looks delicious. Enjoy your Sunday! Your tea menu sounds divine. Love the strawberry and cucumber cream sandwich. Yum. Trina, love the big kite made of paper! Brings back such fond childhood memories. Growing up we lived close to a cemetery. There was one section that was just grass to be used for future headstones. We would take our kites down there and fly them for hours. No trees or wires to worry about. 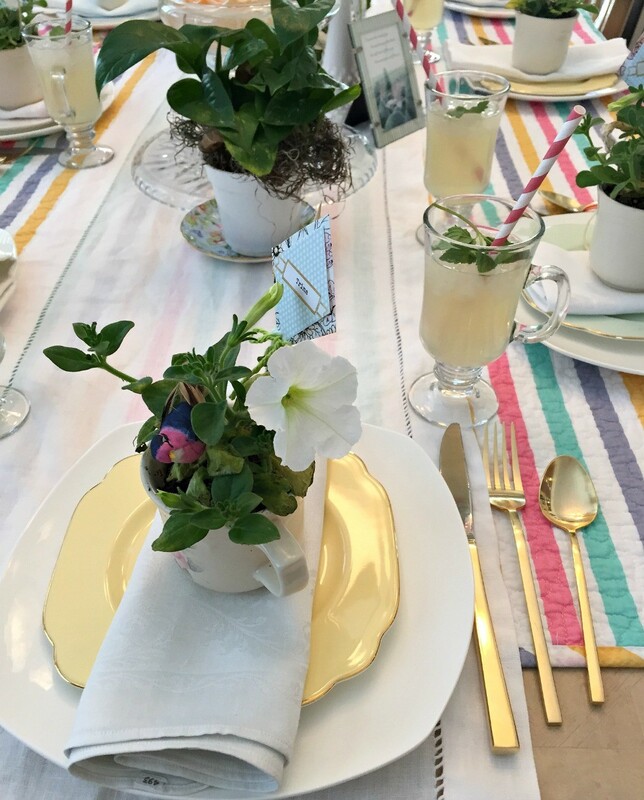 The kite banner and tablescape are so fun and the menu sounds delicious! Thanks for sharing with SYC. Pinned. It was such fun working on this together. Every detail…Breathtaking. Pinned this one to my Party Board! So amazing! I love all of the detail! I had (of course) given so many compliments over your work. Beautiful, arty, creative and inviting. And now my comment is gone. I remember I remarked how much I like the kites in the seventh picture, the three with the round folded pieces behind them. Where do you get these ideas?